Photos courtesy of www.pixelio.de Thanks! Prague is, in my opinion, the most beautiful city in Europe. There is no other major city with such an intact collection of medieval architecture to astound you at every turn. The only problem is that it seems like every tourist in the world has discovered this, too. 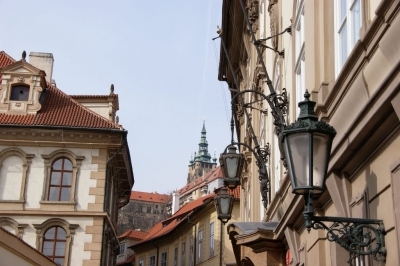 The old town is now fast in the hands of the tourist trade: local Czechs don't even hang out there any more. Every shop caters to the tourists, and the streets are packed with them. 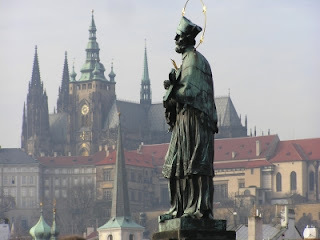 I remember my first trip there, in the late 1990s, when Prague was a paradise, with great food and beer at cheap prices, discovered only by a small number of young Europeans and Americans who were living their own private dreams in the partially restored old town. Most were working as waiters in the daytime, and populating the lively, historic pubs at night. The next time I came back, three years ago, everything was beautifully restored, and too expensive then for backpackers or for the local townspeople. 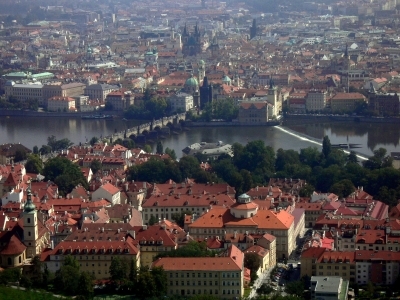 But enough of my grouchy complaints: Prague remains a jewel, waiting to be explored. Chances are that you will spend a lot of time criss-crossing the winding old-town lanes during the day, so here is a route that will take you on the path less-travelled by, and that will make all the difference. (Robert Frost pun intended). We'll run on the other side of the river: up to the castle and its surroundings, then circle around Petrin Hill before running back down to the river again. We'll start right in the middle of everything, right on the 600-year-old Charles Bridge (named after King Karl, who was also Emperor of the Holy Roman Empire during the short time of Bohemia's heyday). I know that the bridge will be sagging under the weight of the tourist masses, but somehow it's the perfect place to start anything in Prague. From the bridge, you have a view of both parts of the city and its strange gothic towers, with the water flowing beneath, the statues gazing above you, and the castle, our first objective, crowning the Hrad Hill over the Lesser Town (east side of the river, across from the Old Town). 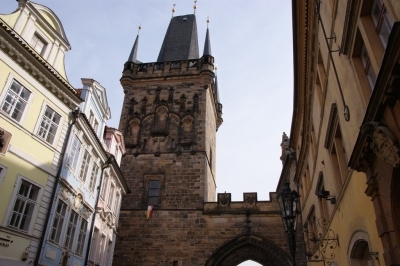 Turn your back on the Prague old town and run west along the bridge towards the squared gothic towers on the town walls straight ahead. You run through the gate and start going a bit uphill along Mosteka, with its beautiful shops. The whole way will be uphill now, until you get to the castle. In 3 blocks, you'll be at an open square, Malostranske Namesti, with its tram station behind the giant St. Nikolas baroque church. Keep running straight, with the church on your right. The street then turns to the right, going around the church, where you now see its impressive front facade and the Maria column in front of Lichtenstein Palace across the street. Keep heading straight north as you cross the next street, continuing on Zamecka. The street ends after a block, and you'll see 2 ways leading off to the left: a street, Thunovska, and a stairway, both running parallel up towards the castle entrance. Take the stairs. Top of the stairs, by Xenia B. 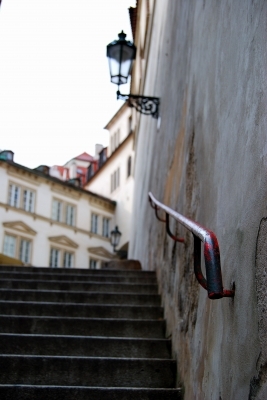 The stairs are steep, so you'll have to decide for yourself if you just walk it or try to keep up a faster pace. There is a great view along the whole way up to the top. Eventually, the stairs will turn to the right and lead you right up to the entranceway into the castle grounds, with their honor guards and statues. And because there is no entrance fee, let's do a loop through it. Just head straight through the first courtyard, then the next. 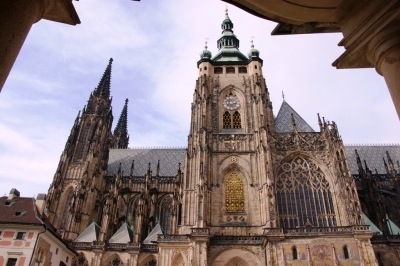 You'll then find yourself staring straight at the St. Vitus cathedral. If you're decently enough dressed (OK, who ever is when they're jogging), you should definitely take a stroll through it. Otherwise, you'll just have to come back later. Continue heading east through the castle grounds, with the Hapsburg kaisers' palace on the right side. They ruled Bohemia from this fortress for hundreds of years, until their empire crumbled at their defeat in World War I. 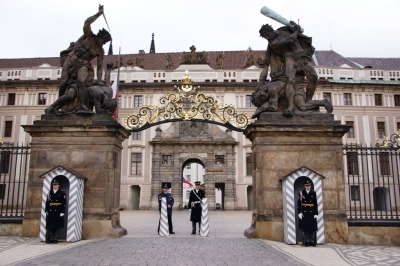 It's now the home of the Czech President. When you get towards the back end of the castle, follow the lanes towards the left to lead you to the Golden Lane and its miniature half-timbered houses. Once you get to the end of the castle, turn around and run back out to the front entrance again, maybe going around the other side of the cathedral. When you get back out to the square, with the castle to your back, you face the neighborhood that serviced the castle, with its scattered palaces of the Austrian and Bohemian aristocrats who felt they needed a residence close to the kaiser's. Keep running straight, past Schwarzenberg Palace on the left and jog a few more blocks until you come to an open square in front of Ceminski Palace, now a government ministry. Turn right for a short look at the beautiful baroque church across the square, the Loreto, built by the Habsburgs as a gift to the Bohemians after their protestant uprising was crushed, and Catholicism was ushered back into the land with an iron hand. Get back on the same street we were on before the detour to the church, and keep heading west. In just a block, you'll see Strahov Monastery coming up on your left. Its baroque church rises behind the row of houses along the street on the left. Stay on the left side, where the street splits into a lower part with the street car tracks, and the upper part rising on the left. You'll see the ornate gate leading into the monastery grounds. 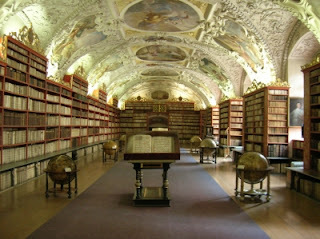 This place houses one of the most beautiful classical libraries in the world, with its curiosity cabinets and old globes. Another place to come back to later! I like to loop through the compact monastery grounds. You can then head out the small exit through the eastern wall (towards your left when you first enter the grounds) and you'll find yourself looking out down the hill at the city across the valley. The whole hillside before you is a green parkland full of vineyards and fruit trees. 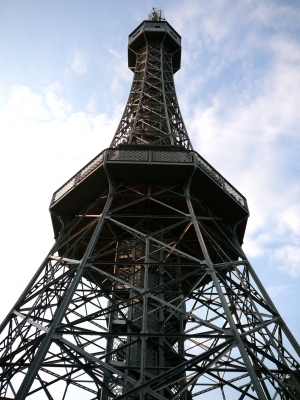 You'll see a path leading southwards towards the Eifel-tower-like lookout tower to the right on Petrin Hill. We'll follow the path, which is fairly level, with open lawns rolling down the slope to your left, and wooded land rising to your right. 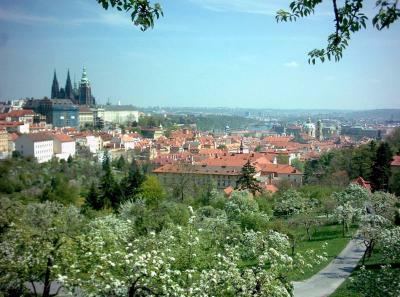 This green area is one of the favorite getaways for Prague families. Just keep heading towards the tower. Above, to the right, is the olympic stadium, and the thick walls of an old fortress that once guarded the hilltop. You could climb the tower: it has 300 steps and costs about 3 dollars, but I'll leave that to more ambitious runners. Continue running straight downhill from here, towards the river. This area is more like a real park, with a network of paths, statues, bridges, and even an inclined railway for people who don't like to walk. At the bottom of the park, you will come out onto Ujezd Street. Turn left and run the couple of blocks to Ricni, where you turn right and run the 100 meters straight to the riverfront park on Klampa Island. You have beautiful views of the gothic towers across the river and of the bridge from here. You could run straight through the park, with the river on your right side, back to the Charles Bridge at the other end of the little island. But we'll take one last little detour here to a special place, keeping to the left to run over the bridge across the millstream when you see the Kampa pizza place. You are now on Velkopievorske Namesti, and in just 50 meters, look to your right. You'll see a long yellow wall all covered with grafitti, poems, lyrics, flowers. This is the John Lennon Wall, started by protesters during the communist days, when John Lennon's lyrics were considered subversive, and people who were caught writing them were put into jail. The police regularly painted over the writing, and young people kept putting it back up. Eventually, the people won, and the wall is kept up to this day. The wall actually belongs to the Knights of the Maltese Cross, and their gothic church and palace behind the wall are interesting in themselves. Velkopievorske Namesti goes on to curve to the right and runs back into Mostecka, where you can turn right and run straight out through the gate tower again, and onto the Charles Bridge. Hope you enjoyed it!